This point represents another one of the many different types of arrow points that were found during the excavation of mound 72. It was found in one of three caches that all together contained about 1200 projectile points. Only two points in Mound 72 were similar to this example. It was discovered within a large cache that contained several different styles of points. All the points in this cache were laying parallel to each other and generally facing one direction suggesting they were once hafted onto arrow shafts. This wide corner-notched point represents one of the artistic styles that are unique to Mound 72. The barbs are rounded and the blade edges are slightly recurved. 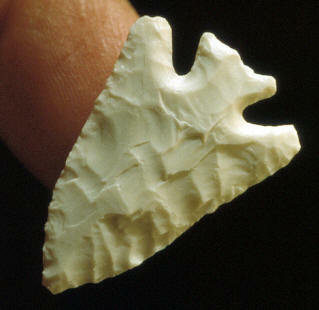 This style may have been influenced by some of the Caddoan arrow point types from Arkansas and Oklahoma. This point is made of white Burlington chert and it measures 1 3/16 inches (3.1 cm) long. 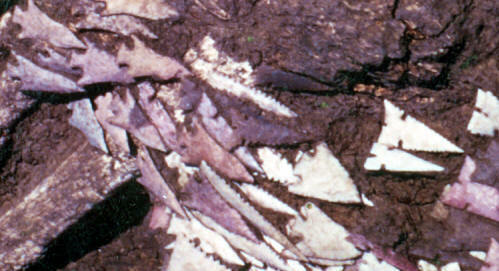 Approximately seventeen different styles of arrow points were found in mound 72. They vary from simple unnotched triangular points to some that were both serrated and notched with recurved blade edges. They were also made from many different types of chert such as silicified sandstone, Burlington, Dover, Kaolin and Pitkin cherts. Mound 72 is a very complicated prehistoric mound structure. It was started as a single mound built over a large post pit. Sometime later two more mounds were added then finally all three mounds were capped into one large mound. After five digging seasons and two thirds of the mound had been excavated, 272 burials were uncovered. Many of these were mass graves, with the burials of victims of apparent sacrifice. Four males in one burial had their heads and hands removed. Another group were laid out in a row and tightly bound on cedar stretchers. Many of the burial offerings were made of exotic materials brought from great distances. Copper was brought from the Great Lakes area, mica from the Smoky Mountains and shell from the Gulf Coast. Mound 72 dates to approximately 950 A.D.